Glass Aquariums: You may temporarily keep your snapper in a water-filled plastic container, but you will eventually need a glass aquarium for your indoor accommodations. Some snapping turtles kept in close confinement develop sores on their bottom shells from constant abrasion with plastic, rocks, or other rough surfaces. The affected areas will initially look more orange than the surrounding color and will progress to pinhead-sized holes in the shell. Sores that do not heal with corrective husbandry should be seen by a vet. In addition, glass enclosures allow your friend to look out. Your baby snapper that wants to hide will soon turn into an intelligent, inquisitive juvenile that enjoys "watching the world go by." 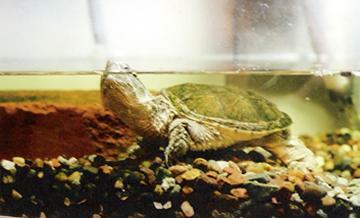 If you house other turtles in aquariums, try placing one end of your snapper's aquarium end-to-end with another turtle's tank, but provide a place for retreat and privacy at the other end. Remember that your snapper is going to grow fast! A one-inch baby will become a 7-inch juvenile in two years with the proper diet. Buy the largest tank that you can presently afford. A rule of thumb is to provide ten gallons of water for each one inch of snapper shell length. Your ten-inch snapper is going to require a one hundred gallon tank. The tank should be long and wide rather than tall to provide more swimming area. Since a snapper will stay at the bottom of the tank most of the time, a tank with shorter walls will facilitate rays from your lighting source reaching your turtle. A 30 gallon "breeder' tank (12" high x 36" long x 18" wide) makes a good first choice for a small snapper. Substrate/Covers: The author and some vets recommend a completely bare-bottom tank, at least for beginners. Snappers are messy, and you will have enough work changing all the water once a week without also doing gravel washes. You will not need gravel to anchor plants or decorations, because your snapper will uproot, rearrange, and eat everything in the tank, including the gravel! Do not place plastic plants, large marbles, or other decorative items in your snapper's tank if you do not want a snapper with a life-threatening intestinal impaction! Snappers in the wild bury themselves in mud at the bottom of marshes and lakes. This environment may be simulated in an outside pond, but the author hasn't experimented with soft substrates in indoor setups. An older snapper may eventually be able to crawl out of the tank. You may need to buy a hood or screen cover or construct your own. Hiding/Basking: Your snapper, especially a baby, should be provided with a hiding place at one end of the aquarium. The author recommends, however, that you do not build a cave with rocks or pile up rocks in the tank. Your snapper is powerful and may bring the whole structure down, pinning your turtle underneath. A good hiding place can be fashioned from a small, plastic kitty litter pan. Cut out one end of the pan, turn it upside down at the end of the tank, and put a very large rock on top to hold it in place. Another option the author has used in an 18-inch wide tank is a 17-inch wide Rubbermaid kitchen stool placed widthwise with a rock on top. The snapper feels secure under the stool but can still see out. Wild snappers usually stay submerged at the bottom of water bodies, but some will bask by either floating at the surface or "hauling out" onto logs. You can experiment with a basking spot by wedging a smooth piece of wood between the aquarium walls and angling it up out of the water. Fasten a clamp light fixture available at hardware stores to the tank rim with a 60 watt bulb (reptile or incandescent) a foot over the basking spot. Water Depth/Temperature: WATER DEPTH IS MOST IMPORTANT! Snappers spend most of their time resting on the bottom and extending their long necks up to get breaths just above the water surface as needed. The depth should be at least a bit deeper than the turtle is wide to allow for swimming and righting the body if turned over, but shallow enough to allow for breathing from a resting position. If your snapper is forced to swim to breathe, it may die from the energy expenditure. A hatchling should be observed to see whether or not it can lift its head out to breathe and the setup changed to include a dry slope if it is having trouble. Snapping turtles need a slightly cooler range of water temperatures than that prescribed for some other species. They will feed eagerly at 68 degrees F or above but become uncomfortable with water temperatures in excess of 77 degrees F (Highfield). Submersible glass tube heaters or other electrical appliances that might easily be broken by snappers should not be used in their enclosures due to the risk of electrocution. The author heats her snapper's tank with a combination of warm room temperatures and a basking lamp. Do not leave a thermometer in your snapper's tank! Lighting: If your snapper does not have access to natural lighting in an outdoor (pond) setup, you should provide a reasonable facsimile for the UVB component. Do not place your tank in a window for several reasons. The water in your tank may overheat and kill your snapper. The glass in the window and the tank will filter out the beneficial UVB component of the sunlight. The sunlight may cause algae to grow in your aquarium. You can buy a hood that holds UVB tube lights to place over your tank or you can make one. If a hood you buy contains glass or plastic strips that protect the tube lights, you will have to remove the strips which filter out the UVB light. Other options include hanging a shoplight fixture with the tube lights over your tank or setting one or more strip light fixtures with the tube lights on a screen cover. The consensus recently seems to be that Reptisun 5.0 tube lights made by Zoomed work well. They lose their effectiveness over time and need to be replaced every 6 months to 1 year. Ideally, try to expose your snapper to some summer sunshine outside in a tub. Don't place the tub in direct sunshine, and do monitor the water temperature. Overheating can kill! Watch your snapper. They are excellent escape artists. You may wish to put a screen with a heavy rock on top of the tub. Aquatic Turtle Foods - Buy the floating turtle pellets like Reptomin and not fish foods.Turtle pellets make a good staple and should be offered regularly. Live Foods - Night crawlers, meal worms, crayfish, crickets, and minnows are a few choices. You have to be careful, though. Don't buy night crawlers grown in animal wastes or bait shop minnows that have been raised in chemically-treated water. Don't get worms, slugs, or insects from fertilized lawns or roadside ditches. Goldfish may carry bacteria and snails may have parasites like flukes that can kill your snapper. "People" Meats - Never give your snapper fatty or raw meats. Always cook chicken which can carry salmonella. Feed only as an occasional treat.Plant Produce - This is a good way to get some vitamins into your snapper. The author's snapper loves chunks of microwaved sweet potato and butternut squash which are loaded with carotenoids, collards with some calcium, and strawberries with Vitamin C. Float some red-leafed lettuce in your snapper's tank and watch it disappear. Wash all produce thoroughly before giving them to your friend. Supplements - You won't need to give your snapper vitamins if you are providing a balanced diet, but offering pieces of cuttlebone as a calcium supplement is recommended. Chip the soft front of the cuttlebone into the tank and throw away the hard backing. Discard any uneaten pieces with each water change or sooner if they start to smell. Feed your snapper in a separate tub to keep your tank clean longer. The water temperature in the tub should be about the same as in the tank or just a bit warmer. Turtles often defecate within an hour of being fed, so wait awhile before returning the snapper to its tank. Feed hatchlings once or twice a day. Small bits of earthworm have often been successful in enticing them to eat. Wave the worm piece in front of them with a toothpick. Larger snappers can be fed three times a week. If your snapper appears to be bulging out of its shell, cut back on its food. If its skin looks loose and baggy, feed it more. You will find an even keel through trial and error. As hatchlings grow, some persons become alarmed when their babies begin to look "furry." Do not apply medications to your hatchlings or juvenile snappers! They do not have fungus or algae growing on them. They grow initially by shedding many, many small bits of shell and skin. A hatchling's shell feels extremely soft at first but gradually hardens with a proper diet. When the shell has hardened up, clean you snapper's shell, top and bottom, once or twice a month with a very soft toothbrush to help prevent any fungal growth. Place your snapper in a small tub of lukewarm water and brush the top shell GENTLY. Make sure to get into all the grooves and along the edges. Brushing the bottom shell can be a bit tricky! While still a size that allows for grasping with one hand, you may be able to hold the snapper upside down momentarily and get in a few brush strokes. The author's snapper will usually freeze for at least 30 seconds when held this way. Check for any light orange or slightly off-color patches and gently brush over them. If beginning or actual sores are present, check your aquarium for rough spots and keep that water clean! Seek advice from a vet for more than the most superficial sores or for any sore that won't heal.